the OTHERS B.C have become an official friendship Chapter. the future is looking bright. 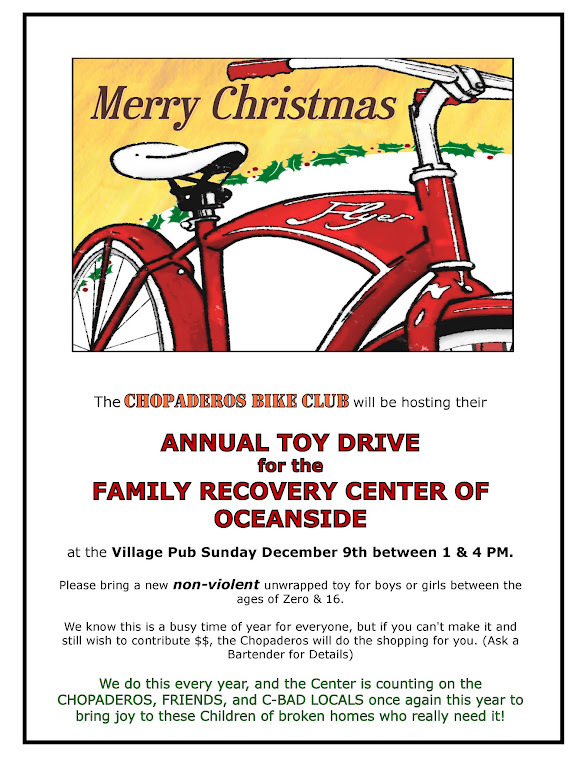 The Toy Drive will be held once again this year at The Village Pub in Carlsbad Ca SUNDAY DEC. 9th. Please bring an unwrapped non violent toy for boys and girls between the ages of new born (age 0 i suoppose ) through age 16. Re: Chopaderos Toy Drive 2012! Monetary gifts for those who can't make it can/will/should be sent where? Those who say "money can't buy you happiness" forgot about prostitution. Bury Me In My Vest. WOW Just received $50.00 from Bokma & scott 419 Canada stylo! double WOW ...just received $250.00 from Thin Lizzy & Swami! well i would have to say that the 12 bars over shadowed the Toy Drive this year. thanks to those who turn out and donated including the Hellrides Bicycle club. here is a nice note from the family recovery center. Please let the Chopaderos know how much we appreciate their generosity. to bring the joy and spirit of Christmas to our house.